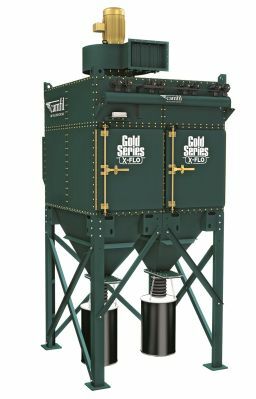 The new Gold Series X-Flo (GSX) industrial dust collector from Camfil APC is built on 20 years of successful performance of the company's Gold Series collector. GSX dust collectors are ideal for industrial applications that produce or process fine, fibrous and heavy dusts and fumes. GSX collectors are designed in modules, so they are easy to build and assemble. Each module handles airflows up to 6,000 cfm using four Gold Cone™ X-Flo filter cartridges. Camfil designed these new filter cartridges with more pleated media and surface area than ever before, so they can move more air and process more dust without increasing the collector's overall footprint. GSX collectors provide a safer work environment in metalworking applications like welding, thermal spray, plasma cutting, laser cutting and abrasive blasting.